This year has started out very well so far. I have ensconced myself in the studio most days and have happily dabbled in lots of different things. 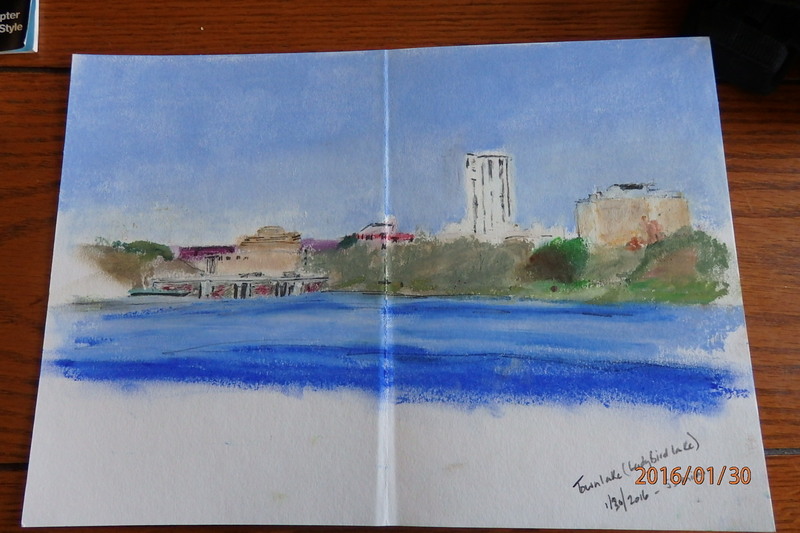 This morning I actually managed to move myself and get down to LadyBird Lake in Austin where the Plein Air Austin group was meeting up. I was only there for an hour as my eldest daughter was visiting later in the morning with my grand-daughter. Normally, I would have skipped out but this year, I am trying to break my habits of lifetime and make an effort! I took along my Sennelier Oil Pastels to draw with, rather than paint, given the time constraints. Also I want to become looser with my work as a lot of times I get stuck in a mudpile of detail. Using chunky pastels stops this as you cannot get detail on a small drawing if your drawing instrument is big. I did use a pencil for some details but on the whole I manage to do what I set out to do. LadyBird lake between Congress and the Longhorn dam. I am finally on last beaded journal page from 2010. I finished the November page in the first week of Jan 2016. So it only took 6 years to complete! This was a lot of hard work but worth it as it has got me back into the swing of beading, embroidery and basically being adventurous, even if it doesn’t actually work out. 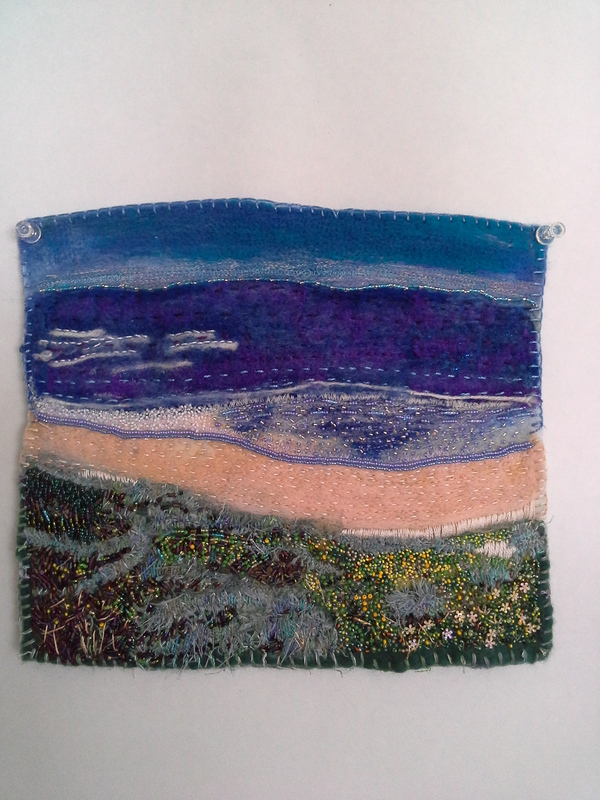 I had a slight panic when I tried out something with the blue sea-line using my felting machine and then singeing it. Just didn’t work. So it was time to just pull it out and start over again. 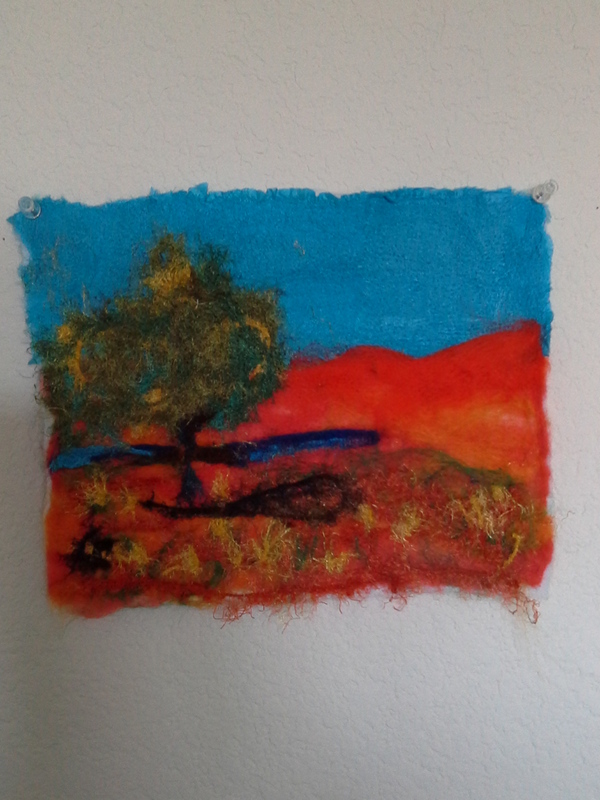 I have started December but have only got as far as the felting as I got sucked into another project. Its looking very raw and bright at the moment. In the mean time I am working on doodling with a punch needle. I went to a bead/quilt show a few years back and came across a lady working on a piece in her stall. Couldn’t resist buying a kit with materials and tool. It’s a very simple process but very satisfying as it works up very quickly. I can see lots of possibilities with it. So February will continue in a similar vein I hope as I explore all the options I have. I am also going to start my running program again as I am going to enter the annual Deutschen Pfest Pfun Run/Walk 5K after I have posted this. 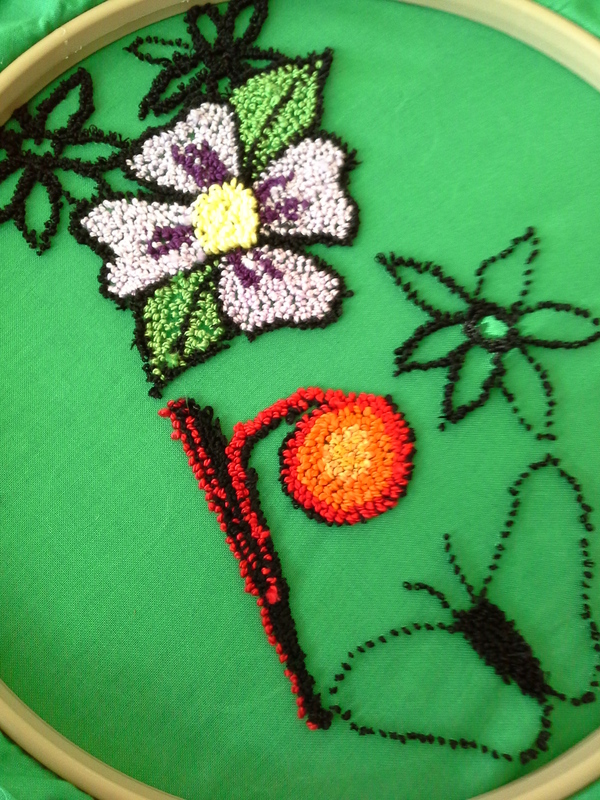 This entry was posted in Bead embroidery, drawing, painting. Bookmark the permalink.